If you have not heard about the HiperFire line of Single-Stage triggers, you should seriously consider them. I consider them the best feeling single stage trigger made and the only one which can ignite stubborn 5.45x39 rounds. Every model they offer is in my opinion a game changing trigger design. Yeah, I know you have heard it all before, however this time it is different and now with the newest Hiperfire HiperTouch TAR24 trigger. The best is even better. HiperTouch’s founder, Terry Bender, had an idea to overcome many of the shortcomings of “match” triggers. Terry is not just some guy filing down sears and swapping out low power springs in his garage, he is a mechanical engineering consultant. 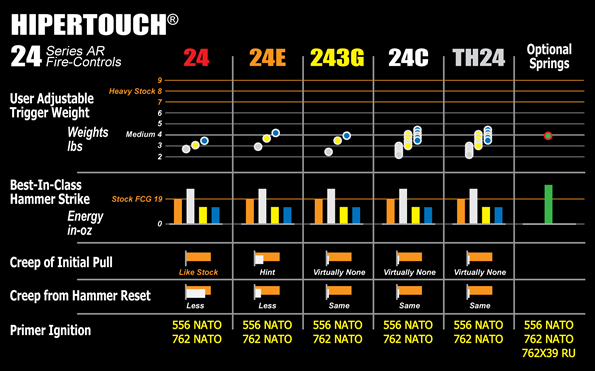 The approach to the HiperTouch design was new from the ground up. The ultimate challenge for a great tactical/hunting trigger is to deliver a smooth, fast, and flat pre-travel, very fast trigger reset, minimize lock time, assure a crisp light break, and with no noticeable overtravel all while delivering a high hammer fall impact. With match target triggers, the goals are the same but with even more refinement of all the above, with no perceptible pretravel. The problem is that many of these trigger design goals are all opposing forces. A smooth, fast, and flat pretravel and crisp light final break all require low forces at the sear which equates to the need for lighter hammer and trigger springs which can lead to light hammer strikes and less reliable ignition. In standard trigger designs, very fast trigger resets, minimized lock times, and high hammerfall impact require heavy springs which creates a crappy feeling heavy trigger. The final dimension is tuning out pre-travel, overtravel, and ensuring a crisp trigger break which are all impacted by the above light or heavy springs. Bad tuning can further impact reliability and safety. The end result is that trigger engineers have their work cut out for them to strike a balance for a great trigger. The compromise has been either a great single stage trigger that may have a light hammer strike here and there with hard primers, or a 2-stage trigger which delivers a 1st stage pre travel which some claim slows down followup shots. The magic in the HiperFire design is delivered via spring cam-ed pressure on the hammer which counteracts much of the hammer spring force within the first couple of degrees of movement around the point of sear engagement. This delivers the perfect situation for a great feeling trigger and break. After the hammer begins to move forward the cam applies pressure the other way and greatly increases the hammer force. This increases hammer fall force, decreases lock time...etc. it's a best of both worlds design and it's a totally new trigger design. The HiperFire has three spring sets (light, medium-light, and medium). Initially, I though the heaviest strongest spring would deliver the heaviest trigger pull however it is the other way around. The strongest spring exerts more pressure on the cam and delivers the lightest trigger feel and also the heaviest hammer fall force. This is what the dual spring and cam design of the HiperFire triggers does. It's a mind screw when you first pull back the extra force hammer and have such a light trigger pull. The newest HiperTouch TAR24 shares all the same key features of the other triggers in the line, but has taken their top tier 24C trigger and added a premium nickel alloy finish and of course a Tarheel blue trigger shoe. All of the triggers are AR15/AR10 fire-control compatible with any lower receiver with industry standard .154" receiver pins. The triggers are screw-less "hard" tuned with static precision springs which inherently makes the trigger more reliable than a screw tuned design which can go out of "tune". The user can tune the trigger at 2,3, & 4 pounds with the three supplied spring sets. Essentially all the semi-automatic HiperTouch HiperFire triggers are identical mechanically once the hammer begins to fall and all deliver best in class hammer fall force. Of course with all these similarities, many will ask what is the difference between them and why woud not just opt for the best automatically. The answer is trigger tuning feel. You certainly do not want a super sensitive trigger on a duty/defense rifle and similarly you would not want a longer pre-travel trigger on a precision match target rifle. The 24C and TAR24 triggers deliver crisp glass-like break for sport and target shooters without any pre-travel. Many shooters including me will say the 24Competition Model has no pre-travel, no over-travel, and a stunningly light break. Obviously there is some sort of travel, but it is so little the finger cannot perceive it. Adding the flat straight trigger blade and adjustable shoe increases trigger control significantly. This is an incredibly fast running trigger which I would love to see one of the top speed shooters run. The splits are incredibly fast. You are going to see more and more 3 Gunners running this trigger simply because it is so fast and light. That said it is too sensitive for a defensive focused AR15 build in my opinion simply because the trigger seems to lack any perceptible pre-travel at all. To me it most closely aligns to a Geissele National Match trigger but in a single stage design. With the 24C, the tunable trigger shoe offers another advantage for both finger acement comfort and fine tuning of trigger weight. The TAR24 was developed as a super premium option to the already spectacularly raved 24C to promote Hiperfire’s sponsorship in the TarHeel 3Gun match. How do you make arguably the best trigger on the market even better? Coat it with a Nickel alloy of course to increase lubricity, further enhance synthetic oil lubrication, corrosion resistance, offer longer life, and deliver something cool looking as a byproduct of the coating. I have several 24C triggers and the TAR24 just feels smoother and that is the only way to explain it. Is it worth the $40 upgrade from the 24C? I think so, however it becomes a comparison similar to that of comparing $2M+ exotic sports cars. If you just need a great trigger for 3Gun the regular 24C will more than do the job, but if you want something extra, the TAR24 delivers just a bit more. In my case I pulled a perfectly fine CMC trigger from my Barnes Precision Machine NP3 coated rifle and dropped in the TAR24. This I though was fitting considering BPM rifles are are made in NC home of the Tarheel. It should be noted that some will want to buy the TAR24 strickly due to its looks however buyers should be aware that over time the finish will react with exhaust gases over time and the look will change but the performance will remain. I installed it on my Barnes rifle simply because the trigger delivers the same corrosion resistance as the rest of the NP3 coated BPM rifle and… well it looked cool. The Geissele, CMC, Timney and other triggers are all outstanding triggers, however the Hiperfire delivers a class leading firing pin hammering like no other trigger on the market. You will continue to see me use the HiperTouch line of triggers quite a bit in builds going forward simply because I believe HiperTouch has delivered on a truly innovative design that actually works both theoretically and in practical use. The price ranges are extremely competitive to other high quality triggers in the market as well... The HiperTouch 24 is a screaming great deal in the $185 MSRP price range and on the top tier we see that HiperFire still manages to make and even their best trigger even better. 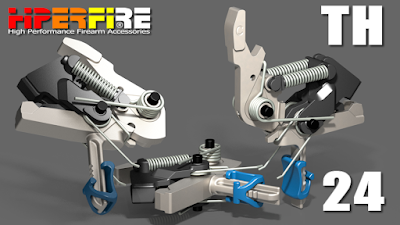 The HiperFire HiperTouch is an outstanding line of triggers which is turning heads in the industry and changing minds about what a great trigger can be.